Today we've gotten a little taste of Magenta-flavored LTE thanks to an image leak of the carrier's upcoming hardware. 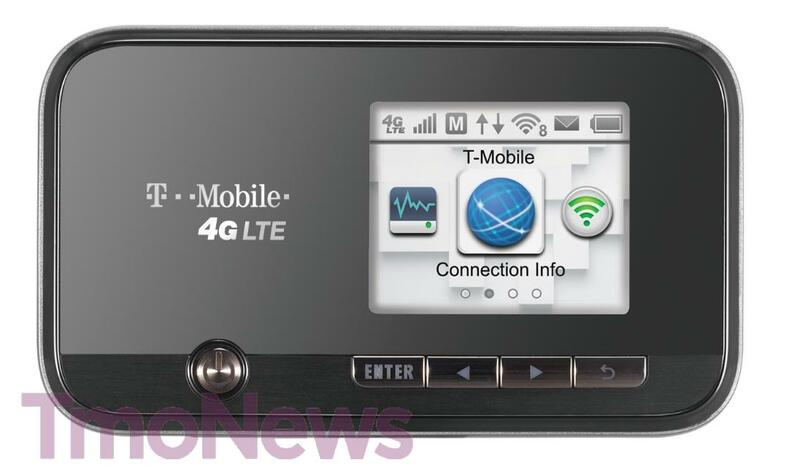 A shot posted by TmoNews has revealed a press render of T-Mobile's first 4G LTE-capable mobile hotspot, which looks pretty much like one would expect a hotspot to. The device is a black rectangle with rounded corners and a color display for changing options, viewing signal strength and so on, and there's also a set of physical buttons for navigating through the device's menus. We can also see an "8" next to the Wi-Fi symbol on the display, suggesting that this unit may support up to at least 8 simultaneous connections. As far as availability details go, a recently-leaked T-Mobile roadmap claimed that this 4G LTE mobile hotspot will be launching on March 27. There's no word yet on exactly how much this thing will cost once it hits T-Mo's shelves, but considering that it's a mobile hotspot, it seems unlikely that it'll put too much of a hurt on buyers' wallets. When it comes to the 4G LTE network that this hotspot will run on, it's expected that T-Mobile will officially flip the switch in Las Vegas any day now, with Kansas City coming shortly thereafter.